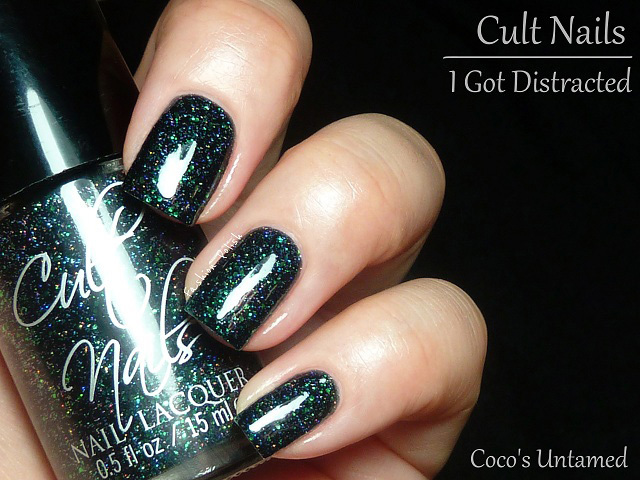 Cult Nails has very quickly built a name and reputation in the nail polish world. No secret recipe for such success but the passion, hard work and personality of its creator and former blogger Maria Morrison, combined with the quality and originality of its products. "As many of you may know, Cult Nails is a family business and when Maria sits down to create polish colors, it's not uncommon for her daughters to have a seat and start creating their own polishes as well. They typically create a polish or two that they want to immediately wear, but Coco became a diehard in the home lab and would create polish after polish like a mad scientist! If you have nails and you are near Coco, your hands will most likely be polished to perfection. The easily distracted Coco knows no boundaries when it comes to nails and polish. You will just have to deal with it as she paints your nails. We had this Spontaneous 12 year old pick her top 5 favorite creations and we are releasing them as her collection! Since she created the colors, we thought it was only fitting that she also name the colors. So Coco and her marketing team (Her BFF Anna) set aside about 30 minutes and began the hard work to name this collection. When Maria asked Coco what inspired the colors, she gave her a look that said it all. The colors themselves were the inspiration." Untamed is a beautiful bubblegum pink jelly spangled with sparse holographic micro glitter. Formula was a dream to work with, fast drying and self levelling. Three coats for full opacity and 2 layers of topcoat to avoid grittiness in these swatches. 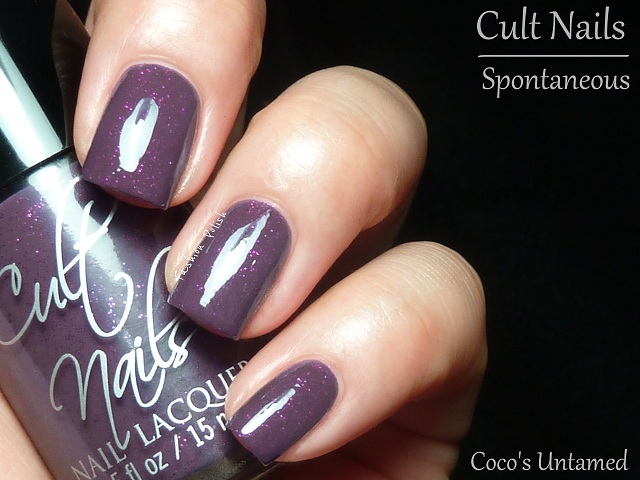 Spontaneous is a dark warm purple with hints of grey infused with bright purple microglitter. Now this is a purple I love! Amazing formula and 2 coats coverage. Again, a little bit of grittiness but nothing a second coat of topcoat wouldn't prevent. 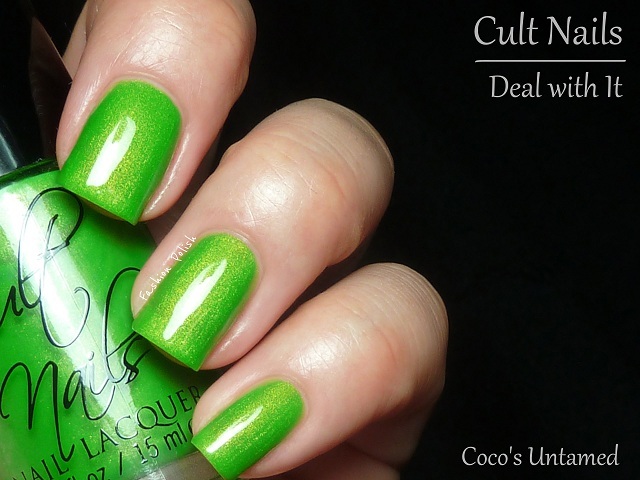 Deal With It is a very bright and saturated green with a bold gold shimmer running through. I don't think I have anything like it in my collection and weirdly enough it looks amazing on. Formula was fabulous and although I still had some VNL at two coats, I didn't bother applying a third. Annalicious is my favorite of the collection, which is kind of a surprise for me. 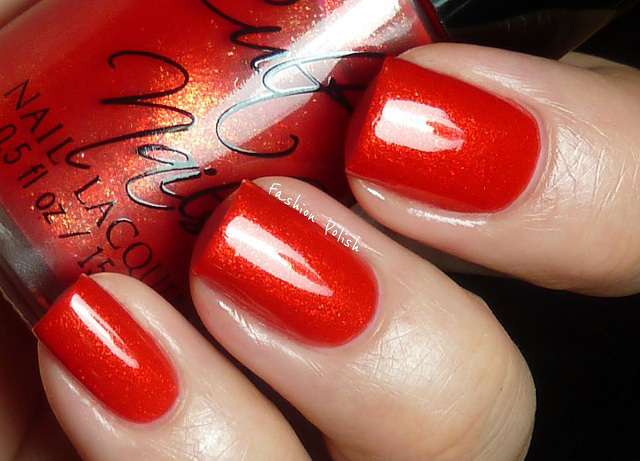 Bright, eye catching, coral red packed with dense red and gold shimmer flecks, it was "love at first stroke". I don't think formula could get any better than this, smooth and pigmented, fast drying, dreamy. This is 2 coats plus topcoat but you could easily get away with a single thicker coat. 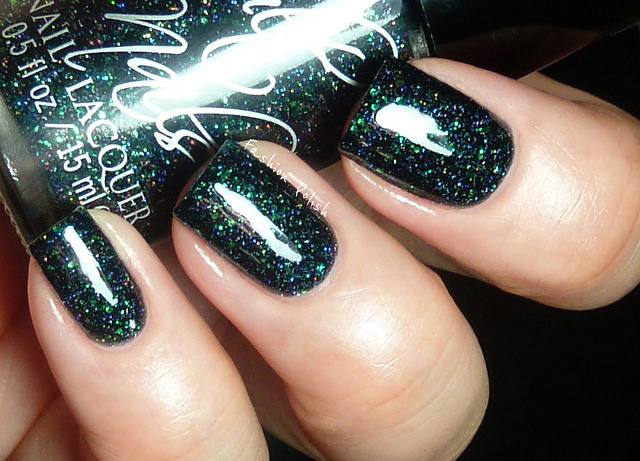 I Got Distracted is a very complex black saturated with small holographic glitter and green flakies. It is so beautiful and different from all of the other blacks I have, and believe me I have quite a few! It was also very pigmented, opaque in 2 coats, and required double dose of topcoat for a smooth finish. 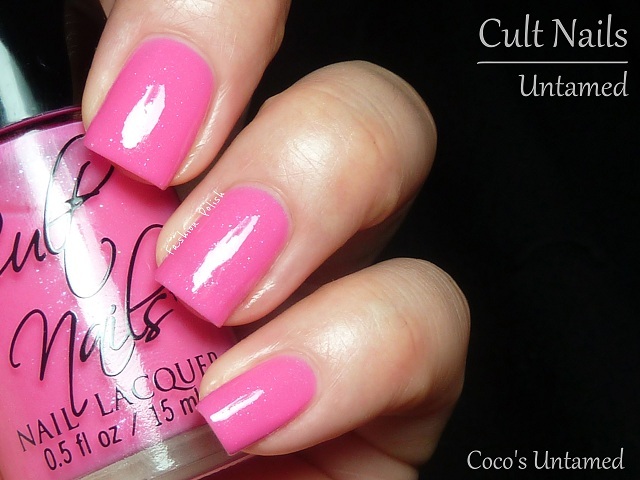 Coco's Untamed Collection is already available on Cult Nails' store and retails for $10 each (0.5 fl oz, 15mL). Have you bought any of these or any other Cult product? What do you think of Coco's collection? I love all these, especially the pink and green one. Brilliant ! I always regret not preordering.. These are just amazing! How do you get your swatches so shiny?! I love them all, but that lime green is amazing! I'm in love with this entire collection! The only one I can see myself without is the red. I got distracted looks so gorgeous that I'll probably have to own it. I'm a sucker for black polish with glitter. These are sooo pretty !! I love "Deal whith it" and "I got distracted". I LOVE LOVE LOVE this ENTIRE collection. I think I might even go back up crazy with a few. I LOVE "I got discracted," despite the weird name. Looking at their site now! I love I Got Distracted - so beautiful! I need the purple, it's sooo pretty. Your swatches and photos are amazing on these. I really like I Got Distracted a lot. I might even put in another Cult order - only have ordered 1 time and have about 9 of them (older shades most discontinued now). I like what I have but admit I was a bit disappointed with the color on the nail vs. shots on line/site descriptions. Guess that is why I have not ordered again because I don't like to spend the shipping and $10/bottle and only kind of like them. Probably have only worn 2 of the ones I have once only. I love your swatches! 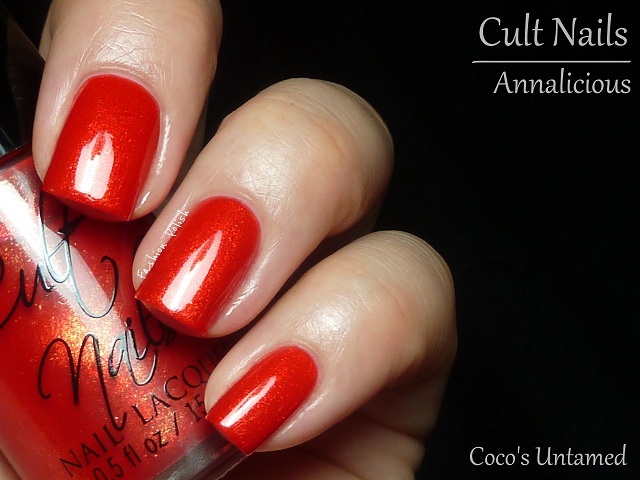 Annalicious is such a glowy, fiery, beautiful color. Of them all, I think it and I Got Distracted are my must-haves. Annalicious is eo amazing, it glows under the sun! I have it on my toes, and I have Deal With It on my fingers. This collection is amazing! It is a must have! 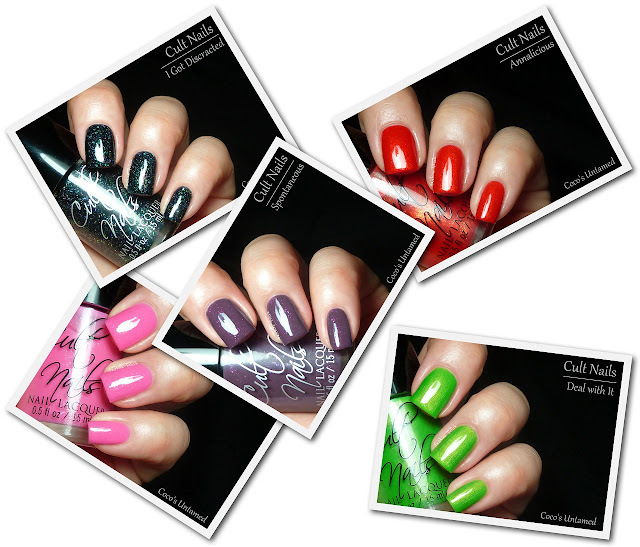 Untamed, Spontaneous and I Got Distracted are my personal faves- love the glitter! I love colors. Congra for this blog! Spontaneous and Annalicious really need to come live with me!